In a tough X-Factor final, Michela won the honour of representing Malta at this year’s Eurovision Song Contest. Four acts had made to the final where they fought for a record deal and the guaranteed international exposure from the stage in Tel Aviv, Israel. Malta went a different direction this year. They dropped the traditional national final, and instead went for the well known international TV format X-Factor, which however hadn’t had a Maltese edition yet. 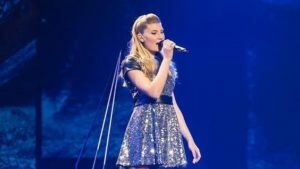 The winner of the talent show wins a record deal with Sony Music and will represent the small island in the 2019 Eurovision Song Contest this May. Petra had to leave the competition as the first of the four finalists. Nicole Frendo as the second one, leaving Owen Leuellen and Michela in the so-called Super Sing Off. UK 2018 X-Factor winner Dalton Harris performed in the show with The Power Of Love just before the final result was announced. As judges/mentor in this X-Factor Malta we had Howard Keith Debono, Ray Mercieca, Alexandra Alden and Ira Losco. The latter represented Malta on two previous occasions in the Eurovision Song Contest; in 2002 where she finished in second place with 7th Wonder and again in 2016 where her Walk On Water came in as 12th. 31 apppearances, 24 final positions and no win yet. That’s the basic facts about Malta’s Eurovision history. The country debuted in 1971, and unfortunately the country finished last in their first two years. Until 1991, their participation was a bit on-off, but since then, they have been a steady country. Their “new” debut in 1991, was with the song Could It Be by Paul Giordimaina and Georgina, which finished second. The following year, Mary Spiteri came third, and Malta had proven themselves as a country to watch out for. In fact, it wasn’t until 1999 that they eventually finished outside top 10 again. Ira Losco came 2nd in 2007 and the same great result was achieved by Chiara in 2005 singing the beautiful Angel. The past two years, in 2017 and 2018, Malta has failed to reach the final putting a bit of pressure on this year’s X-Factor winner.